This set offers an engraved blade duo with high detail custom scabbards. The handles offer imitation ivory ray skin with black nylon cord wrapping and cast metal guards. Includes black lacquer tabletop display stand. 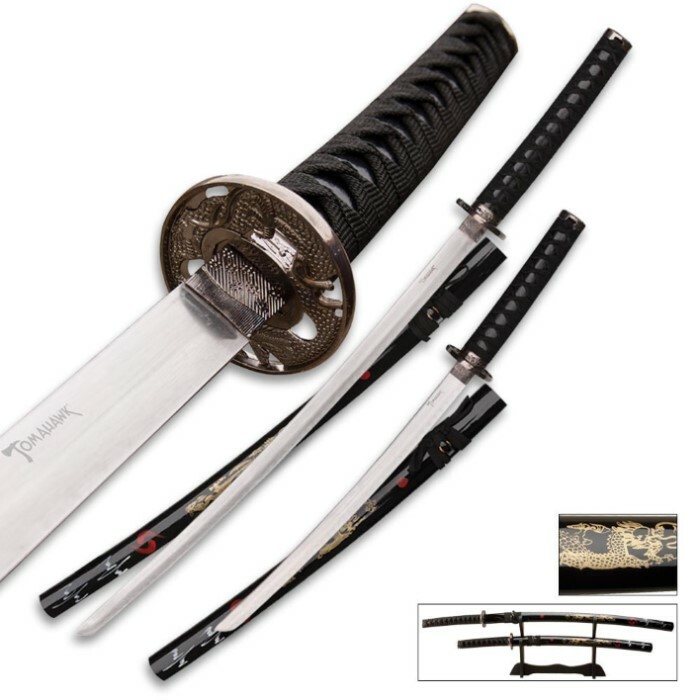 Katana: 36 1/2 overall, 26 1/2" blade; Wakisashi: 27 3/4" overall, 19" blade. When I took these swords of the box my jaw drop there beautiful There not super sharp but they are sharp They make a great addition to my collation of knives and swords. True Swords Fan here ... having made 3 orders in the last month!! An honest review of this item. Dragon Duo Pretty Japanese Sword Set... It arrived with 1 of my 2 recent orders. Its a really nice looking sword with nice designs on the scabbard! However, upon arrival and excited to see these I immediately was disappointed after opening up the first one. Although very nice looking and fully intending them for display only, I still think craftsmanship is a big plus. The scabbards were extremely tight and didn't seem to fit the swords well. Obviously not full tang the Blade itself, Habaki and Tsuba were all very loose and easily rattled when shaken ever so slightly. Damn shame too because they had great potential even as a display but even my display swords shouldn't be as loose as these were. They almost immediately went right back into the packaging and box for return shipping. Disappointed that their doesn't seem to be a quality check before shipping these or basically any items out of the warehouse. Sorry True Swords but I have to give this product a 2 based on the overall craftsmanship. If another set was inspected and passed a quality inspection, had tight fittings and parts, I would consider a replacement set of the same. This product is a excellent deal. It arrived very fast and on time. The original product that I bought was damaged during shipping, but, after explaining what happened they were very fast and considerate and replaced it. An excellent service. I had recently ordered these cause I liked the way they looked. 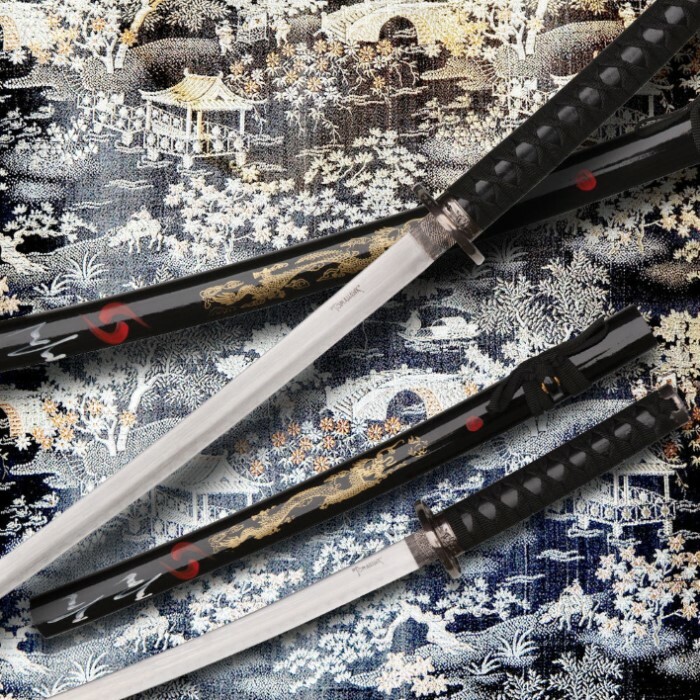 There were no kanji engravings on the blades, instead a printed word. I believe what should be printed on mine should say "tomahawk" but the print wasn't finished, saying "tomahaw"
Well worth the price. Even though the swords are by no means for playing, they are sturdy and well made. Ordered these for my stepfather and brother and they LOVE THEM!! They look amazing over the fireplace. This is their first sword and they had fun just thrusting the blade thru the box it came in but adore it as a display piece. They both look forward to their next order from trueswords. i honestly love these swords. i gave one to my student who i am currently teaching swordsmanship to. and he loved it. the swords are well crafted, nice detail, good size blades, the only thing wrong is that they arent sharp which i will fix that problem myself so its all good. but other than that great buy. i just ordered another sword off of here not too long ago. so keep up the good work guys! Its good altogether but it doesn't look like the picture thats shown, for instance the dragon on the sheath is actually gold and has a different design opposed to the silver one in the photo, and there is no lettering on the blade of either sword, and the handles wear not completely attached to both swords. over all they are good but they are not what i expected, from them being so different from the picture. Amazing, thats all I can say about it. this is my first buy from true swords and it wont be the last. the swords are beautiful and well put together. the shipping was fast and cheap. i only compliant i can even think of is the swords had so scratches on them and they were not sharp but other then that they were perfect.